Do you want to create more success in your life? This life-changing book will provide you with the inspiration, motivation, ideas and tools you need to make simple yet powerful changes that will allow you to create the success you desire. Discover why the mentors, business leaders, teachers,speakers and trainers in this amazing book have appeared around the world on shows including OPRAH,The Tonight Show and Good Morning America. 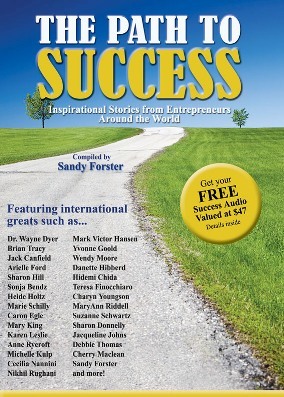 The Path to Success shares with you over 50 inspirational stories from entrepreneurs around the world. Affectionately called the "father of motivation" by his fans and Anne's favourite personal development author & speaker, Dr Wayne Dyer is one of the most widely known and respected people in the field of self-empowerment. He has authored over 30 books. Wayne Dyer stresses using the power of thoughts and of intention to get you what you want in your life. America 's “Ambassador of Possibility”, The Chicken Soup for the Soul idea was just one of many that has propelled Mark into a worldwide spotlight as a sought-after keynote speaker, best-selling author and marketing maven. His credentials include a lifetime of entrepreneurial and publishing success and personal and professional development. Jack Canfield, America's Success Coach, is the founder and co-creator of the billion-dollar book brand Chicken Soup for the Soul and the nation's leading authority on Peak Performance. Brian Tracy has consulted for more than 1,000 companies and addressed more than 4,000,000 people in 4,000 talks and seminars throughout the US, Canada and 40 other countries worldwide. Brian's goal is to help you achieve your personal and business goals faster and easier than you have ever imagined. America's # 1 Book Publicist, Arielle Ford has mastered the art of making things happen. Whether generating widespread news coverage, creating a successful special event or launching leaders in the field of human potential, Arielle knows who, what, when, where and how to do it. For the past twenty-five years, Arielle Ford has worked in nearly every aspect of public relations and marketing. Her clients have included bestselling authors (including 11 authors who reached #1 on the New York Times bestseller list), new products, tourism bureaus, world class hotels, non-profit organizations and fundraisers,Fortune 500 companies, real estate, film, television, celebrities, medical spas, world class athletes, the sports of professional boxing, wrestling,tennis, golf, indoor soccer and sports car racing; beauty pageants, andeven astronauts. International speaker, millionaire mindset mentor and bestselling author, Sandy has taken what was her biggest challenge and turned it into a vision of possibility for millions of people around the world. She inspires, empowers and encourages others to create more than they ever thought possible. Law of Attraction Coach and author, Anne will uplift you with her story of breaking free from unhappiness and her discovery of the JOYgasm - an appreciation tool that she credits with saving her life.